Along with April showers, May flowers and the most terrible allergies; spring season welcomes a delicately fresh new release of colors and products from most beauty lines. But really - I'm actually obsessed with everything about spring. Seriously, is there anything prettier than spring flowers? If you're like me and you consider nail color a crucial accessory to your look of the day, you should immediately go purchase these fab spring shades. These gentle but powerful pastels scream 'BRB I'm about to go lie down in a field of bluebonnets.' Depicted above are the 6 shades that have me absolutely drooling over my own hands every time I polish with them. 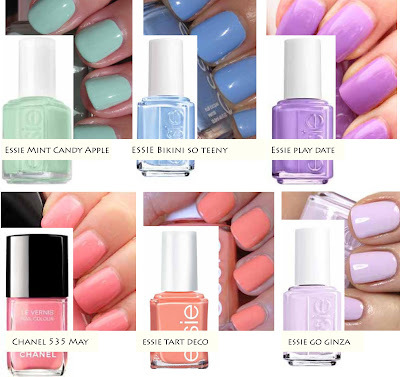 What are your spring nail polish favorites?